Republican presidential hopeful John McCain said Monday that a new message from al Qaeda leader Osama bin Laden in which he scolds his followers in Iraq proves that U.S. efforts there are succeeding. "Basically he encouraged the extreme elements - al Qaeda in Iraq particularly in the Sunni areas - to join together and be more effective in bringing terrorism and murder and suicide bombings to Iraq and to Anbar province," McCain said. "It's a clear sign that we are succeeding in Iraq because people got very tired of al Qaeda taking their young women, killing their young women, killing their people, and acting in the most brutal fashion that they are." In the audiotape played Monday on Al-Jazeera television, bin Laden chastises some of his followers for lagging behind and making mistakes in Iraq, and for putting their personal allegiances ahead of their opposition to American forces. CBS News White House correspondent Peter Maer reports that the White House on Tuesday said U.S. intelligence believes the tape "is authentic." Referring to the taped message calling for Iraqi insurgents to unite, spokeswoman Dana Perino said, "We would not be surprised to hear that message." "It sounds like words from a leader, an al Qaeda terrorist, trying to capture some lost ground," Perino added. She also told reporters the U.S. strategy has brought some success but she added, "There's a long way to go." Perino described al Qaeda as "an enemy of humanity." Stopping to meet and greet voters at a country store, McCain commented in response to an undecided voter's question about his strategy for Iraq - whether he would follow President Bush's path and stay in the war, or reduce the number of U.S. troops there. McCain said he is the only Republican who criticized the conduct of the war under former Defense Secretary Donald H. Rumsfeld, and that he believes the troop escalation over the past year has been effective. "I believe if we set a date for a withdrawal we will be back," he said. McCain also spoke to Denise Gionet of Pelham, whose son, Army Sgt. Daniel Gionet, was killed in Iraq in June 2006. Gionet told McCain that some in the military community are appalled that missing soldiers are being designated "duty stations whereabouts unknown." "The category should be MIA. POW/MIA," replied McCain, himself a former Vietnam POW. "I do not understand and we have written letters and we are in communication. That needs to be fixed." 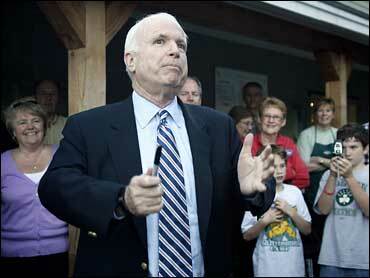 McCain began a three-day campaign bus trip across New Hampshire on Monday. He was expected to file candidacy papers for the New Hampshire presidential primary on Tuesday in Concord.